Dare to get up close! Dinosaurs are coming to Carousel Park at Melbourne Zoo, and they have a secret! 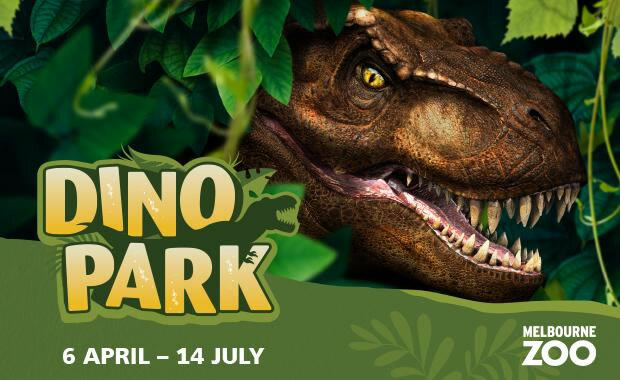 The Zoo has teamed up with the creators at Erth Visual & Physical Inc to present Dino Park; a unique walk-through experience where you will literally see these prehistoric creatures come to life. Pass through quarantine before entering Dino Park to be careful not to contaminate these precious species! Prepare yourself to get up close and personal with the roving dinosaurs, and you might even be lucky enough to watch a Dino Keeper waking a dinosaur from their slumber. Find out how these beasts evolved into an animal that we know today, and how you can help us fight the extinction of this dinosaur's relative. Kids under 16 visit FREE on weekends.